For breaking soft to hard materials – ranging from lightly reinforced to heavily reinforced concrete, and from highly fractured rock to unrelieved granites. Designed for excavators ranging from 40,000 to 166,000 lbs. Tramac’s Patented ERV™ Energy Recovery Technology captures bounce-back energy waves – normally lost – and adds them to the next blow, delivering 15%-20% more blow energy than any other hammer in its class. TRAMAC’s V-Series hammers with patented BRV Technology. When breaking hard materials, impact power is of primary importance. Conversely, for breaking softer materials, it’s the striking rate that governs productivity. V-Series hammers respond to changes in hardness as material is processed by automatically adjusting to the optimum combination of impact power and striking rate. 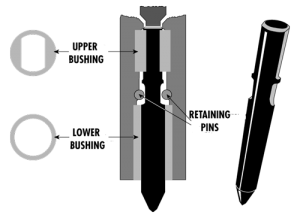 “Soft Start” For Superior Control: Low energy starting allows the hammer to create a small niche in the rock, which helps hold the tool in place as the impact power is increased, preventing slippage. Automatic Lubrication Assures Full Operating Life: The most critical safety precaution on a hammer is to insure constant lubrication of the working tool. All V-Series Breakers are equipped with TRAMAC’s HammerLube™ System. Slim Tapered Shape enables Tramac breakers to work closer to the side of a trench, eases work in confined areas and promotes operator visibility. TPS™ Tool Protection System: Tramac’s V1600, V46, V56, and V65 models feature the new TPS, a completely re-engineered front end that substantially lengthens the tool life of larger hammers. The redesigned geometry of the new front guide, tool and retainer pins, and the oversized bushings of specially formulated hard bronze, reduce friction and wear. Torque is carried by the upper bushings instead of the retaining pins, which now only serve to keep the tool in position. Wear parts and tools last longer, keeping operating costs down. – Unique feature of Tramac breakers. Metro-Silenced (MS) versions of models 50 and above are available for noise-sensitive work locations. – Enclosed housing and soundproofing materials absorb noise.